I think the main reason it took me so long to make these is that I really had NO IDEA what I wanted to do. I ended up resizing and re-doing a card a did a few weeks back ... just changed some of the elements to make it into a 5.25" square card .... 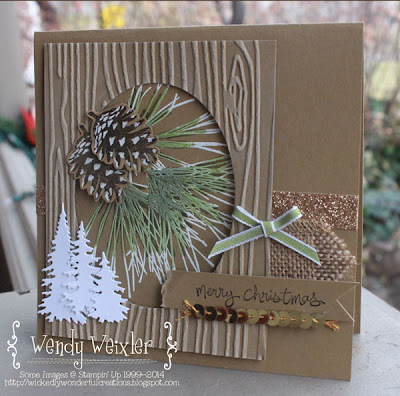 Cutting out all those ding-a-ling pinecones was a labor of love, I tell ya ... they were too cute NOT to cut them out, though! In a large mixing bowl, stir together the flour, baking soda, cinnamon, ginger, nutmeg, cloves and salt. In a separate large bowl, use a wooden spoon to cream the butter and brown sugar until smooth. Stir in the molasses and egg and mix until well blended. Gradually stir in the flour mixture until combined. Cover the dough and refrigerate it for at least 1 to 2 hours or until firm enough to roll into balls. Heat the oven to 375 degrees. Use a teaspoon to scoop the dough out of the bowl, then roll it with your fingertips into balls that are about one-inch in diameter. Roll the balls in a shallow bowl of granulated sugar. Place the balls on an ungreased baking sheet, leaving 2 inches between the cookies. 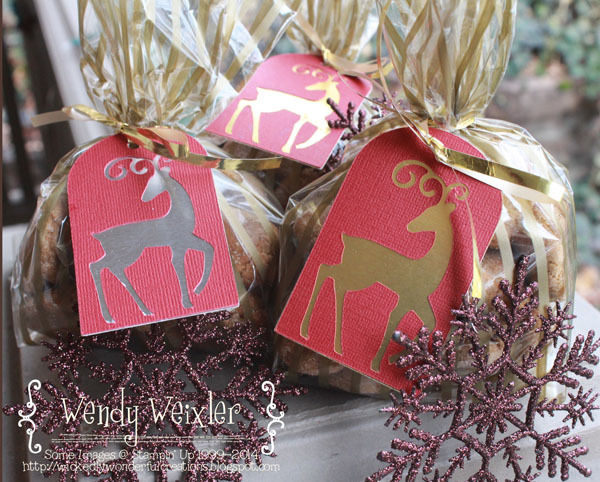 Bake for 6 to 9 minutes or until the cookies are crinkled and set. Cool the cookies on the baking sheets for about 5 minutes. Using a metal spatula, transfer them to a wire rack to cool completely. Repeat until all the dough is used. The cookies can be stored in an airtight container in the freezer for up to 1 month and at room temperature for up to 1 week. Special note: This is a recipe that does NOT double/triple very well. If you want to make LOTS of them, you should make a separate batch of dough each time. Have the Happiest of Holidays. Here's wishing you love, peace and good health for the upcoming year ... thank you for being part of my life. I am blessed to have so many wonderful friends!! So here we all are ... right smack-dab in the middle of the holiday hustle and bustle ... and a little bit of CRAZY. Time for a TIME OUT with the Control Freaks!! If you've been following the Tour all the way around, you should have just come from the ROCKIN' projects of Dawn Olchefske!! 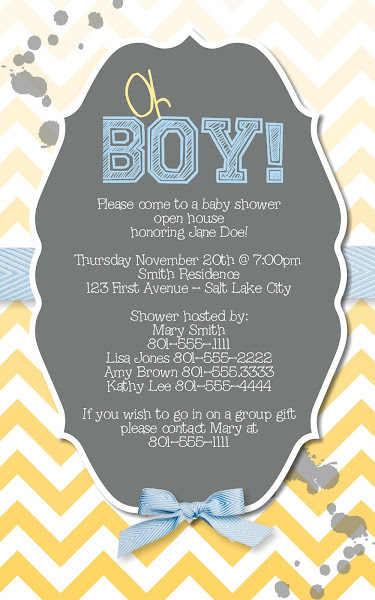 We are all creating with some sneaky-peeky preview stuff from the upcoming Occasions and Sale-a-Bration catalogs!! Let's get started!! First off ... what is NOT to love about this LEMON??? OhMyGoodness!!! 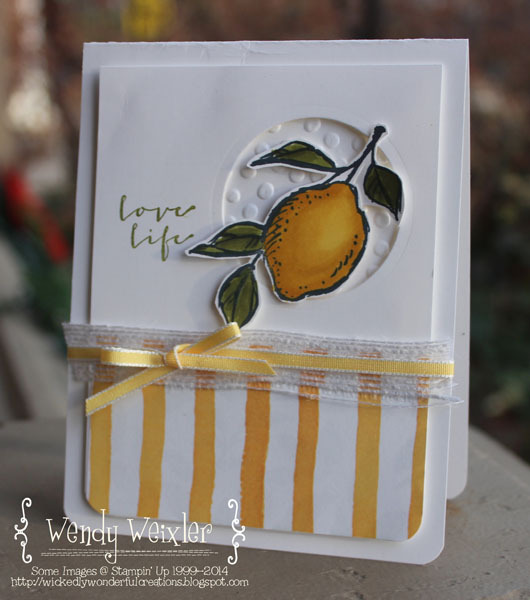 As soon as I saw this lovely lemon (which is part of a set called "A Happy Thing" that you can earn for FREE during Sale-a-Bration staring January 6! ), I KNEW it WOULD be MINE!!! I have a thing for all things citrus-y ... could NOT resist this!! And isn't the DSP just DELISH???? And of course y'all KNOW how I have a THING for BUTTERFLIES!!! OhMyGoodness (did I say that already???)!!! EEEEeeep!!! Wow!! DROOOL!!! 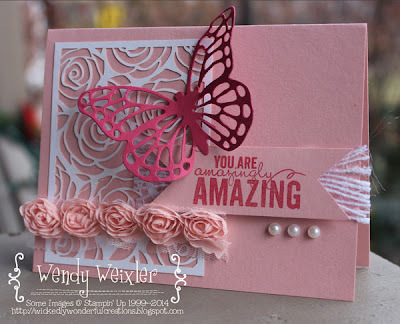 There's a GORGEOUS new set of butterfly thinlits dies ... HappyDance! OdeToJoy!!! And those roses (the laser cut ones and the beautiful "ribbon-y" ones??? 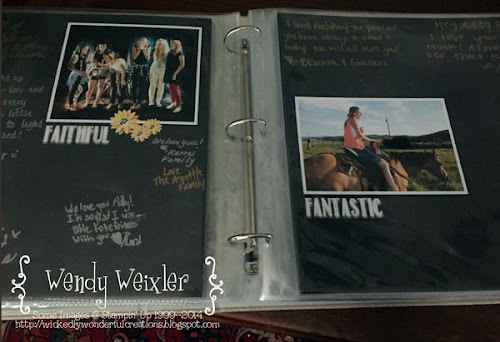 Yeah ... those are part of the Artisan Embellishment Kit that you can have for yourself from the Occasions Catalog). There is SO MUCH to LOVE coming your way, people!!! I'm DYING already!!! Onward and upward to see what Julie Davison has to share ... you're gonna LOVE it!! To be honest, I am ACTUALLY working on Christmas cards!!! Which actually DO have MDS components to them ... which I am NOT quite ready to share with the world ... so I am sharing something I did a few weeks back ... for which MDS came GALLOPING to the rescue since I was asked to do this as a favor for someone the day before it as needed (isn't that ALWAYS how we do things???). Next up??? The awesome Amber Meadows!! Click on the "next" button below to see what she has to share! 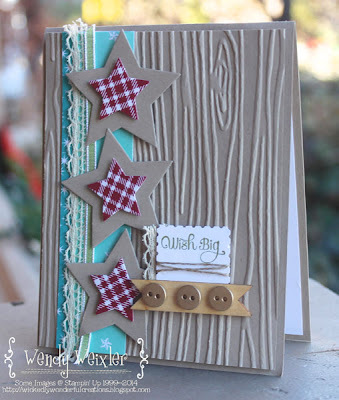 I am kind of addicted to Crumb Cake cardstock ... I use it more than pretty much ANY other color. I blow through that stuff in a HURRY!!! Not quite sure what my fixation with it is lately, but I am really liking it right now! 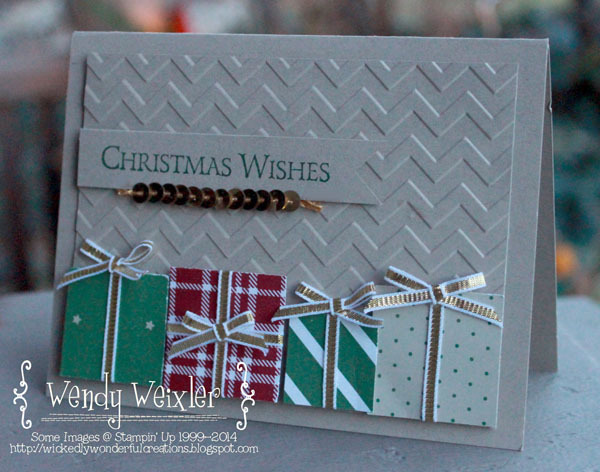 This was a pretty quick and easy card for me ... just used my 1", 1 1/4" and 1 3/8" square punches to make the little packages .... easy peasy! 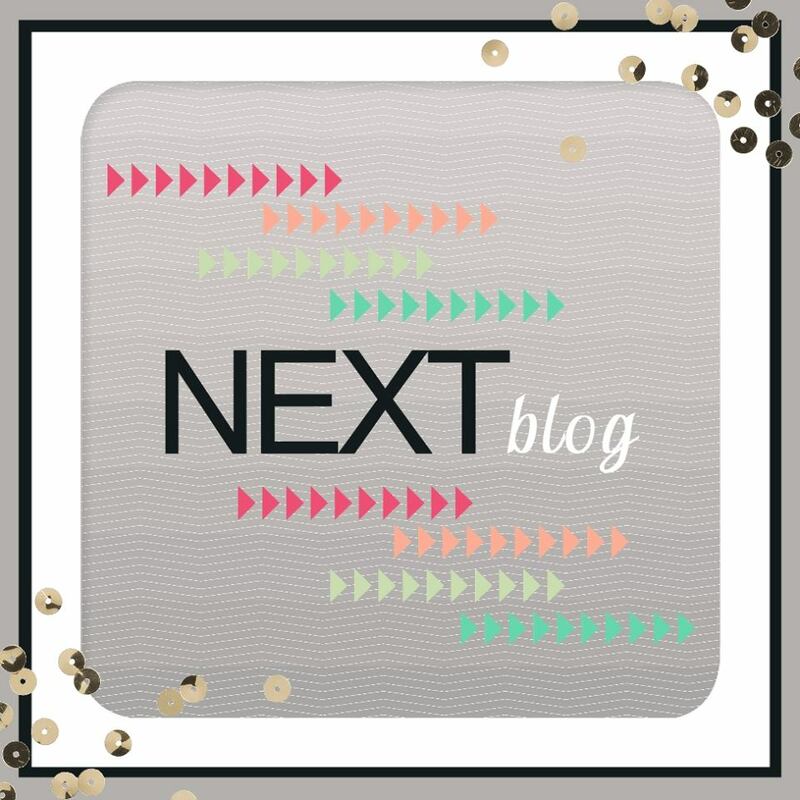 Click "Back" to see what Melissa Stout has to share, and/or the "Next" button to see what Amy O'Neill has cooked up for everyone this week! Happy Fantastic Fab Friday!! I am SO excited to share with you what I made for this week's color challenge ... and I am going to be HONEST with you ... this one quite nearly STUMPED me!! This color combo looks SO very Christmas-y!! And I was STRUGGLING with the Old Olive component of this ... and I was ALSO trying to make a NON-Christmas-y card. So you guys can SEE why I was stumped, right??? All in all, though, I'm VERY happy with what I came up with!! See all the pretty colors??? I can't wait to see what all y'all come up with for this challenge!! It's also SO great to see what directions everyone goes with these challenges. I get SO inspired from what YOU guys come up with! 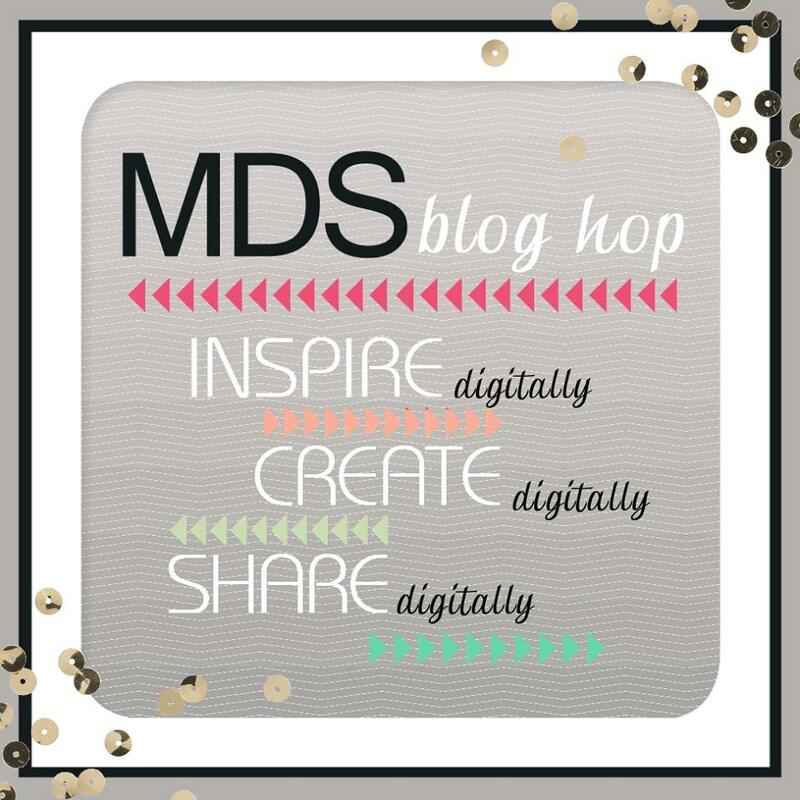 MDS Blog Hop - Welcome to December! Hey, friends! 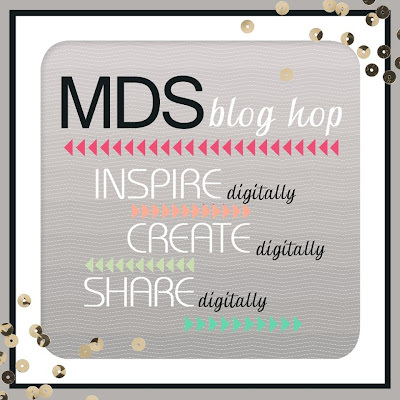 Welcome to another fantastic hop with the MDS Blog Hoppers! This week we are actually SUPPOSED to be sharing some sort of Christmas Memory/Tradition project ... and I am going to admit right up front that I am cheating ... 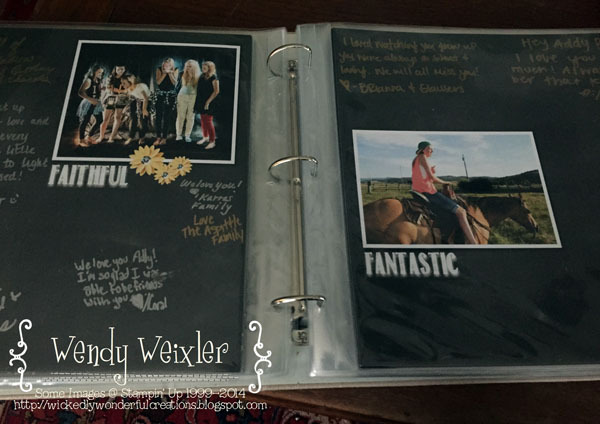 I worked my fingers to the bone last week working on a project that was challenging on so many levels, so I just wanted to share parts of it with you. 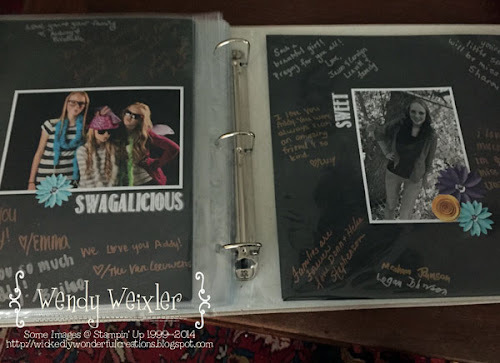 In my last blog post I mentioned what I had been working on ... the daughter/granddaughter of some dear family friends was tragically taken at the sweet and tender age of 12. I felt so honored, humbled and blessed to have been asked by the family to make a memorial book to share at the funeral. 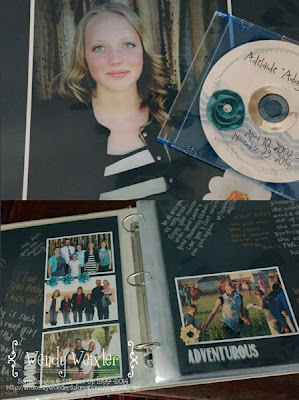 I received SO many photos from family and friends that I was able to use them to make a slideshow to be used at the viewing prior to the funeral as well (I used MDS images to make a label for the DVD's, too!). I was somehow able to complete 36 pages in one day!! And thanks to the help from the photo department at Costco, I was able to get them all printed into beautiful 12x12 photos in the same day (with the funeral being right after Thanksgiving, time was VERY short!). I am so grateful for the opportunity I had to do something for people who I love, care about and respect. When tragedy strikes it is often so easy to feel helpless ... I was glad to have had something I could DO to help (even if it was in a small way).